We open from where we left off last issue, with the boys being sucked into another dimension after having defeated Kraklow and his super powered henchmen made of "magical clay". The boys are immediately attacked by a large creature with tentacles. Jon uses his powers to try and get himself and Damien free. He is suddenly helped out by two girls, Hard Line and Big Shot, who not only free them from the creatures' grasp, but also help them find some sanctuary. They head back to a small village where Hard Line and Big Shot live with more of their people. The girls explain how their world, called Eoroe, was taken over by a being called Ygarddis, who turns out to be the being that the girls saved Jon and Damien from. It turns out that Kraklow in this dimension was a great wizard and helped Hard Line and Big Shot escape from doom when Ygarddis attacked and took over. This comes as a shock to the boys, as they had just faced Kraklow on Earth and he was no hero there. Jon however recalls that his father once told him about how there are many Earths, with many different versions of the same people, and that this may have been the case with Kraklow. Damien tries to come up with a plan for him and Jon to return to their home dimension. Jon is more concerned about helping Hard Line and Big Shot and what remains of their people, from Ygarddis. Later, Damien returns from reconnaissance, he tells Jon that he had been exploring their surroundings and has learned much about the landscape. Jon tells him of his own theories regarding Kraklow and the "magical clay" that Kraklow used against them back home, and how it may be what Ygarddis was really after when he attacked Eoroe, and that the Kraklow of this world gave the clay to the Kraklow of Earth, thinking he too was a powerful wizard and one of the good guys. Story - 5: I'm digging this story so far, it's been really unpredictable at best, and thrown me for a curve a couple times. 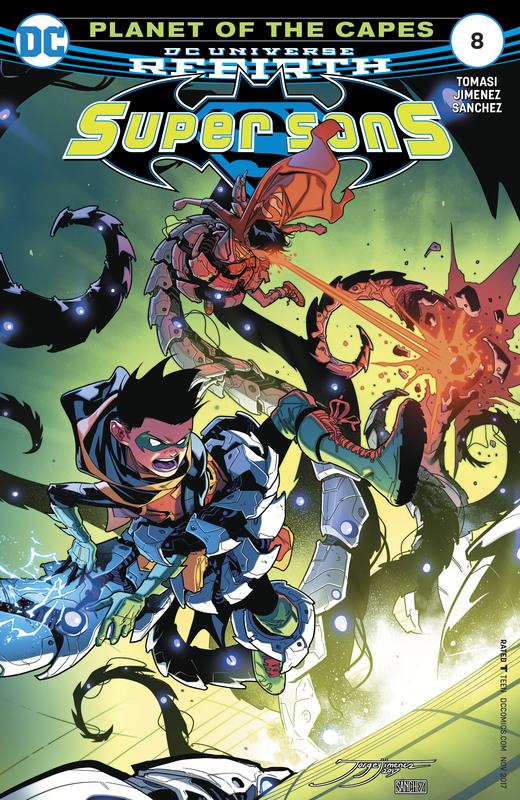 My initial thoughts were that this arc would be about Jon meeting other young heroes, such as the Teen Titans, and a character like Kraklow was a throw away villain. However I like the continuity that Tomasi has established within this arc so far, and how the multiverse possibly is coming into play. Speaking of the multiverse, it may have been just a passing comment on Jon's part, but I love the fact that Clark has told him about the many different Earth's that exist outside of their own. I found it especially ironic, seeing as how Jon and his parents were refugee's from the Pre-New 52 era before Mxy changed their history. It's small details like this that make me love Tomasi's writing. Another thing that I enjoyed was the introduction of the characters Hard Line and Big Shot. I'll cover more about their looks in the art section, but I just wanted to touch on how other worldly they felt. Aside from the extremely 90s superhero names (something you'd expect from Image comics characters), Tomasi wrote them in a way that reminded me much of the New God's and the citizens of New Genesis. I'm not sure if that was his intention, but that's the feeling I got from it. This also could be, because I have been reading a lot of classic Jack Kirby lately, and I am being influenced by that. Saving the best bit for last, the exchange between Jon and Damien is absolute gold, at the end of the book. Damien comes back from his reconnaissance, and during that time he has explored all that he can about Ygarddis. He has learned every artery and vein of his circulatory system. This to me is a very Batman thing. In the past I've praised Tomasi for the way he's written Jon, much to the sensibilities of Superman. But here, I loved reading that Damien is a chip off the old block of the Dark Knight himself. Yes, I know that Damien has been established as such for many years, but reading him in a book such as this one, one that has a much lighter tone than the Bat-books, Damien is much more enjoyable. The line where Damien tells Jon about Apokolips, "Pray you never have to see it", only just makes me want to see the boys on an adventure on the hellish planet. I must say, that Tomasi has done more with Damien than Grant Morrison ever did in my opinion. 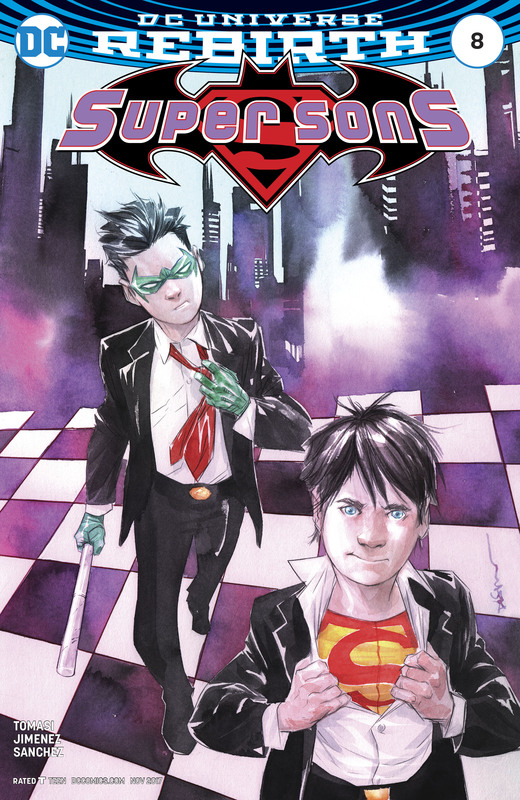 To relate it back to Superman, Morrison is the Jor-El to Tomasi's Pa Kent when it comes to Damien as a character. I had never been a passenger on the "Damien Fandom Train," but I do like what Tomasi is doing with him each issue, and it has won me over greatly. His observation about the air and the water supply are the type of details I love about this book's storytelling as a whole. I can't leave it simply on Damien's shoulders, the way Jon came to the conclusion regarding that the Karklow of this world sending the magical clay off to Earth to the Kraklow there, and how he may have assumed that the Kraklow of Earth is a good guy, and that the clay is possibly what Ygarddis uses to feed on, was another piece of genius writing in my opinion. Really looking forward to the next issue and seeing where this arc will pivot to next. One of the best books that DC is publishing right now. Art - 5: As usual, Jimenez illustrates an incredible issue once more. This book wouldn't be what it is without his art. I loved that this time we get to see something so different from him, as he takes us to an alien world, full of jungle and swamp and monsters like Ygarddis. As usual, the characters look very animated in their body language and facial expressions, and this time it is kicked up a notch, with their surroundings being unfamiliar and dangerous. I've always enjoyed his renditions of our two young heroes, but this time we are treated to a couple of sassy young heroines in Hard Line and Big Shot. I love that they feel like they almost came out of a Mad Max movie, crossed with possibly New Genesis or more appropriately Apokolips. They both look like they have been through hell, despite the fact that they don't look much older than both Jon and Damien. How an artist can convey this, is a credit to his skills. There is a lot of subtle detail as usual from Jimenez, such as Hard Line and Big Shot's piercings and tattoos, Ygarddis face and tentacles, the army made of clay, whom all have different individual looks to the weaponry used by all characters. You can get lost just trying to soak it all in. The mannerisms that both Jon and Damien have, the way Damien leans on Jon's shoulder to wipe his boot, to the big thumbs up that Jon gives the kid that he saves. Tomasi may capture the voice of these young heroes, but Jimenez captures their spirit. I don't think anyone else can do these boys justice, the way Jimenez does. Damien in silhouette, really looks awesome. Jimenez shows that sometimes less is more when it comes to storytelling. Alejandro Sanchez again graces these pages with his great palette. He helps this book capture its perfection, and is just as important as Tomasi and Jimenez are. I love his colors. I always find myself reading this book twice. Once for the story, the second to soak up the art as best I can. Cover Art - 5: I like this cover. There is a lot happening in the sense of action. Both boys are defiantly trying to escape Ygarddis' tentacles.